Have you heard of Mint? If not, chances are you’re living in the dark ages when it comes to financial management. Reading on just about any personal finance blog, you’ll eventually come across Mint. Why? Everyone talks about it because it’s one of the most versatile apps for money management. It doesn’t just help with budgeting, or investments, or managing debts; Mint helps with all of that and more. For in depth details about the app, click here to read our review. Today, I’ll be going over what I see as the most important aspects of the app. This is my favorite part of the app. I’m a busy guy. So, it’s almost impossible for me to sit down for a couple of hours a week manage all of my accounts. I’ve got to remember websites, passwords, and other data. Once I get into the accounts, the pen and paper method of tracking just doesn’t work for me. With Mint, it’s possible to link all of my accounts. Therefore, all I need to do is log into my Mint dashboard and everything is there on display for me. I can access everything I need in one place! It’s kind of funny that I talk about budgeting so much because it’s something I absolutely hate doing. As a matter of fact, I’ve spent the last couple of years researching and coming up with methods that make budgeting easier and more fun. Let’s face it; if it wasn’t such a boring process, more of us would do it. Mint takes the pain out of budgeting. Of course, having all of your accounts in one place makes budgeting easy enough, but they go far beyond that. In the user dashboard, you’ll receive budget and spending insights. Mint will take a look at your spending, your income, and your bills; then return tips on how to get and keep your budget under control! Any free money management app, website, or other piece of online technology is going to have some sort of ads. It’s how they can afford to operate a free service. However, often times, the systems are convoluted with ads that just don’t make sense. With Mint, even the ads they show are money management tools. Based on the information they’ve been able to gather from your personal financial portfolio, Mint will show you ads for products that will help you. For instance, if you’ve got bad credit scores and are in the process of trying to improve your credit, they may show an ad for a secured credit card. If you’re investing and not getting returns that they know one of their partners can send you, they’ll show ads for investment platforms that may be better. The bottom line is most of the time I look at ads as a headache placed improperly on an app. In this case, the ads really are tools! Mint really is an amazing app. If you’ve read our review, you already know that. However, if you are using Mint, it’s important to pay attention to the 3 tools I mentioned above. I mean, what’s the point of using the app if you don’t connect your accounts and use the tools? 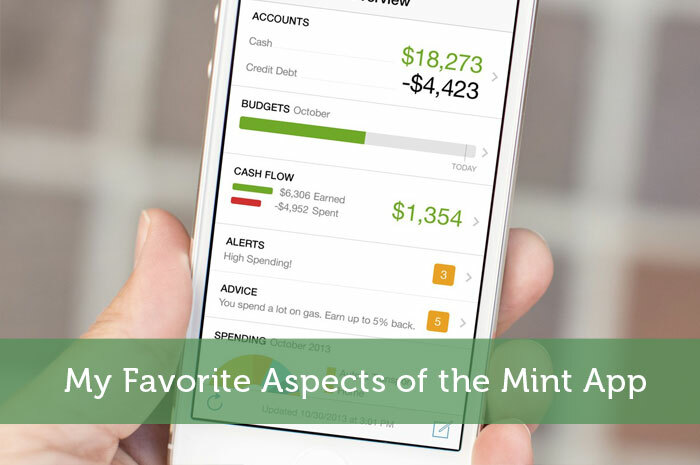 What’s your favorite part of the Mint app? I just started using the Mint app earlier this year. I’ve been an Excel budget spreadsheet kind of gal for the longest time. I still use the spreadsheet, but I find Mint is a great way to complement it. I love how Mint provides a snapshot of all your accounts and investments and calculates your net worth. I also enjoy the pie charts that give a great visual indicator of where your money is going. My favorite is the net worth tracker. I love how it pulls home value data from the web so I don’t have to check that individually. It’s cool to see how it changes over time. I think Mint is great and the concept is excellent but giving all your passwords to another institutions not approved by many banking institutions and is therefore quite a risk. If you have no money … not a problem since there is nothing to steal. I used Quicken on my machine for 15 years and tried Mint but I could not justify giving all my passwords. Since Quicken doesn’t work on a mac, I also switched to spreadsheet and I am good with it. The benefit is that I can use my own calculations. The one thing for me is that I don’t need to babysit my budget and little spending. I pretty much use one credit card for all my spending and I just export it to my spreadsheet to see my spending ratios. Technology is great but as you know, you are not supposed to use the same passwords and you end up putting them all in one place. I work in the technology sector and there is constant hacking and phishing of accounts and I would rather be protected. I will say that if it helps someone get their finances in order, go ahead. I was a little leery of those risks as well, but Mint is verified by TRUSTe, Verisign and RSA Security, so I felt a little more comfortable. I also have identity theft insurance, so this gave me the comfort I needed to try it out. I’ve been using it for a little over a year, and so far so good. I’ve been using Mint for years. Another great thing is that it sends you weekly budget progress reports, and you can actually set that to send to your spouse as well. It’s a great way to keep my wife in the loop with our finances, even though I’m the one who primarily manages them. I’m not a huge fan of Mint, but then again, I haven’t used it in years. I’m sure it’s improved since 2011 when I last used it. My frustrations with Mint were that I had to spend so much time categorizing all of my purchases at the end of the month, that using an Excel spreadsheet was quicker. I have to say though, I do love how Mint linked the accounts. That was really helpful. Think I’m probably in the minority on this one, but I’ve never tried Mint. My finances are pretty simple so its not really necessary but it does look cool. Perhaps I should give it a shot. I love the Overview and the Budget area. The overview adds your account totals together, so instead of thinking “Okay, I have this much in this account, and around this much in that account, so my total should be around this much” you get an actual total! And I love the budget part because I can always check and see if we are getting to close to overspending in a certain area and it helps me plan more ways to save! Also, the overview truly gives you an overview. It adds up your accounts, along with your debts and gives you a true picture of your money.